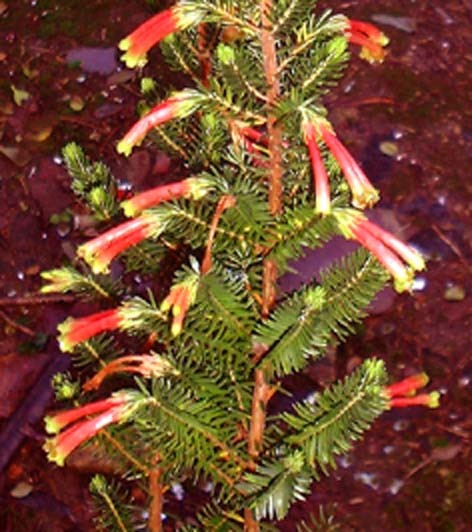 David Robinson's family have chosen the December 'plant of the month'. This month it is Cymbopogon validus. The name of this grass comes from the Greek kymbe, meaning boat, and pogon meaning beard. 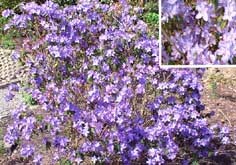 It is a warm temperate plant normally grown as ornamentals for foliage and for the light elegant flowering panicles. 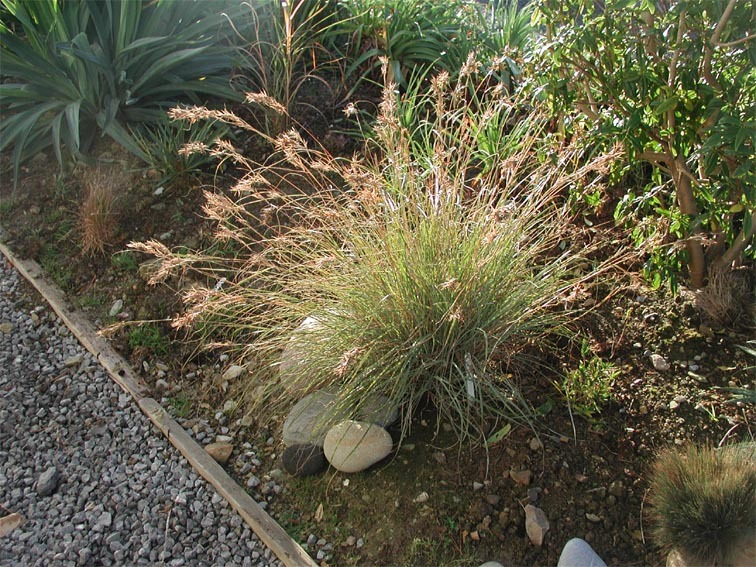 David Robinson's family have chosen another 'plant of the month'. This month it is Acer palmatum septemlobum 'Osakazuki'. 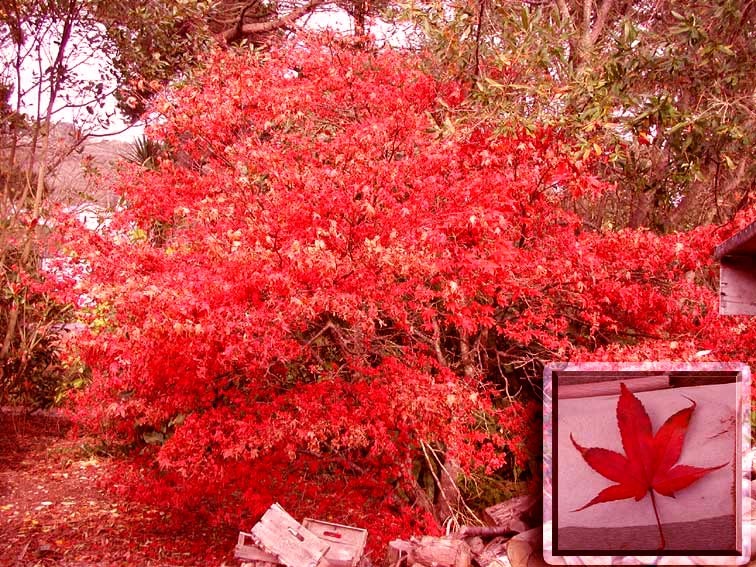 Although this plant has been chosen before (in 2001), this year it again put on a spectacular display in Autumn as its green summer leaves turned to perhaps the most fiery scarlet autumn colour of all the Japanese Maples. We were a little late in photographing the plant in all its splendour, but the strength of the colour can still be seen. David Robinson's family have taken on the task of choosing a 'plant of the month'. 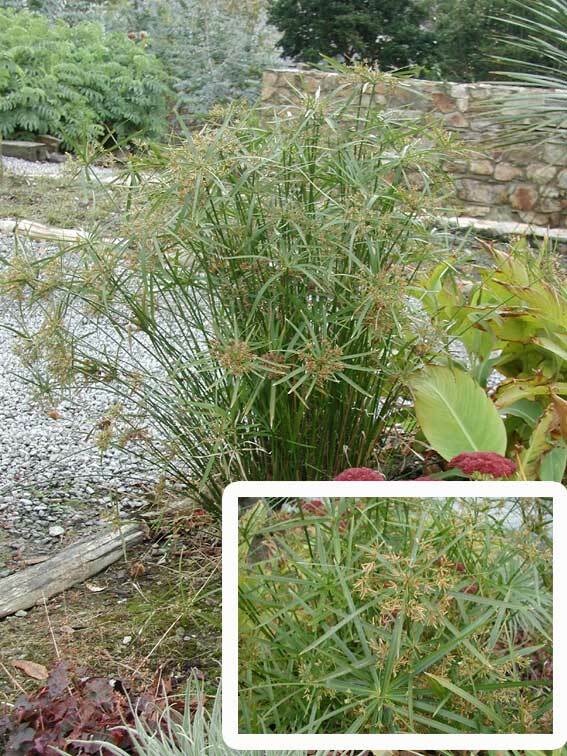 We have chosen this month what we believe is Cyperus alternifolius (please mail us if incorrect). This plant is a native of the swamps of Madagascar and is a relative of the papyrus of the Nile River. It survives best in a tropical environment and would often be seen as a houseplant in more northerly climates. This specimen started out as a houseplant, but was moved outdoors around 8 years ago. It is surviving well, having lived through many frosts over the years and is now around 1.5m tall. It loves wet conditions, so our climate in Ireland is ideal! 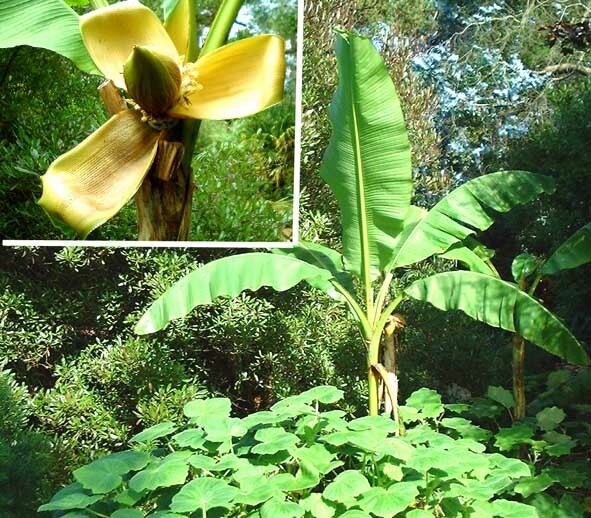 The banana (Musa basjoo) from the Ryukyu archipelago south of Japan is an easy plant to grow at Earlscliffe. First planted in 1972 it has survived even the hardest winters without protection . 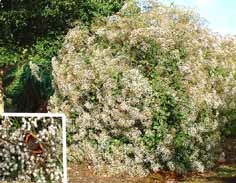 Its large soft leaves are easily damaged by the wind and it often looks miserable during the winter, spring and early summer months. 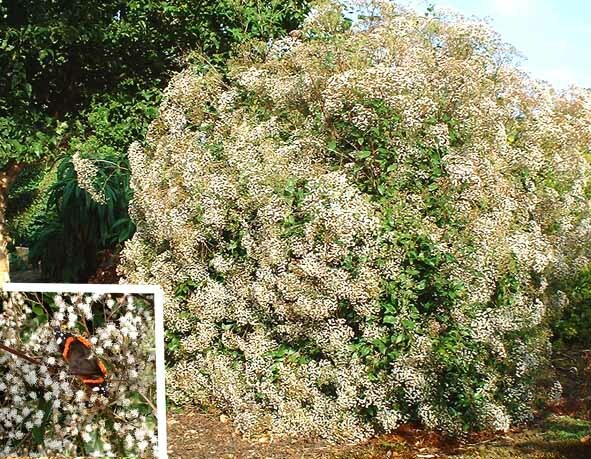 It is at its best in the late summer, early autumn with its enormous leaves, unusual flowers and small clusters of tiny green, inedible fruit. The plant at the base is the hardy, large leaved Pelargonium papilionaceum from South Africa and, in the background, a 5 metre high Dodonea viscosa 'Purpurea'. Eupatorium ligustrinum, a native of Mexico, Guatemala and Costa Rica, is a useful late flowering shrub with a haze of rose tinted flowers from August until November. The flowers are pleasantly scented ànd are attractive to butterflies. This plant has never shown any sign of low temperature injury even after the very cold 2000/01 winter. 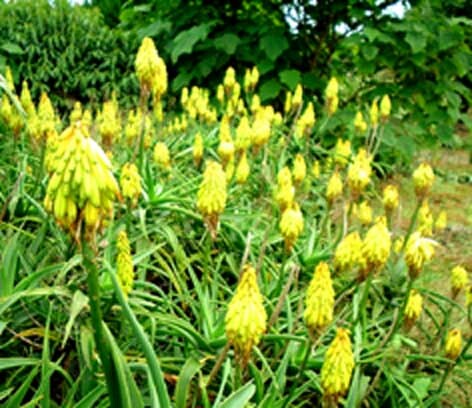 Aloe striatula is the hardiest and most floriferous of a large number of Aloe species tested at Earlcliffe. It has never shown any sign of weather damage since planted 35 years ago, has survived -7.5°C and flowers regularly. A. striatula is much hardier than A.vera but appears to have many of the same medicinal qualities. It is one of the easiest of plants to propagate here as branches stuck in the open ground root readily at any time of the year. 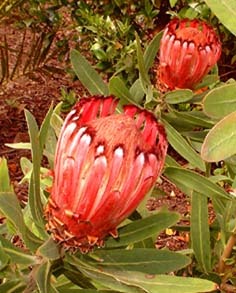 Protea neriifolia growing in ordinary garden soil but in a well drained situation. My policy of not using fertiliser on trees and shrubs is useful for Protea spp as they are extremely sensitive to nitrates and phosphates. This plant was obtained in September 2000 as a small seedling and was planted outside in May 2001. The attractive goblet shaped blooms are about 12 cm long and the plant flowered for the first time in November 2002. This plant is one of many Echiums that self seed themselves prolifically around the garden. It is 2.5 metres tall and is apparently a hybrid between Echium wildpretii and E. pininana, being intermediate in height between its two parents. This plant has inherited flower colour and density of inflorescence from its female parent (E. wildpretii) but usually such hybrids are more purple in colour. It is possible, therefore, that the male parent is an Echium wildpretii x pininana hybrid rather than E. pininana. Pure self sown seedlings of E. wildpretii also occur but do not normally grow to a height of more than 1.6 metres. Rhododendron 'Saint Breward' with its violet blue flowers provides a pleasant contrast in April to the warm colours of the Kurume azaleas, Camellias and Pieris. Saint Breward is a hybrid of R.augustinii. There are many mysteries associated with this month’s little known plant, Juania australis. 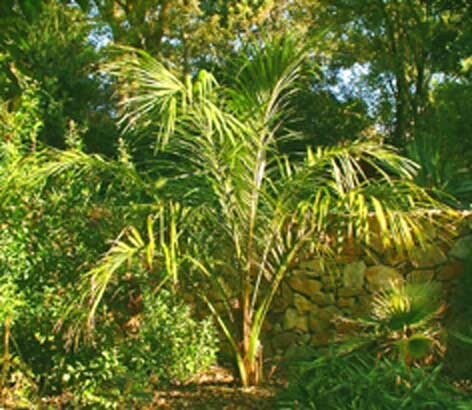 It is not mentioned in the New RHS Dictionary of Gardening and it has been described in Chamaerops, the Journal of the European Palm Society, as ‘the Ungrowable Palm’. J. australis is native to the Juan Fernández Islands situated at 33° S. It is a rare palm, endangered due to habitat destruction. Export of seed from Juan Fernandez Islands has been banned by the Chilean Government. It is on the IUCN Red List of Threatened Species. It was given to me as a young plantlet by Chris Bailes, Curator of the RHS’s Garden at Rosemoor, Devon in September 1995. His parting words were:- ‘It won’t grow outside with you, it doesn’t even survive at Tresco’. After planting it in the garden, the young plant experienced the exceptionally cold 1995/96 winter when the temperature fell to –7.5° C, the absolute minimum recorded at Earlscliffe since records began in 1969. This had no adverse effect on the young Juania and it has proved to be the fastest growing palm in the garden, requiring no attention since planting, apart from routine weed control with Roundup. This palm should be more widely planted in coastal areas of Ireland but seed is difficult to obtain due to export ban. There is reputedly only one fruiting tree (in Chile) outside its native Juan Fernandez Islands. We would appreciate any information on possible seed sources. 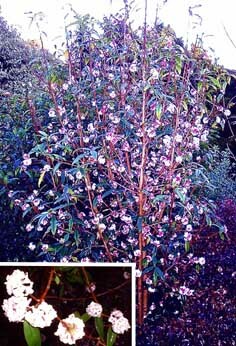 Daphne bhuloa, from the Himalayas, is a superb winter-flowering shrub - good to look at and even better to smell. It begins to flower in December and continues until March, without showing any signs of frost or wind injury. 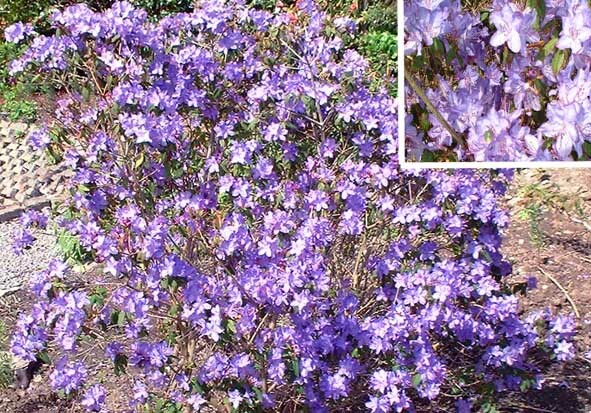 Young flowers are purplish pink in colour and become white as the flower ages. The main attribute of Daphne bhuloa is the intense sweet fragrance from the flower clusters which can be smelt over a large area on a calm day. With the advent of micropropagation, it is now more readily available in garden centres . Erica versicolor is one of the numerous Cape Heaths that can do much to provide interest and brighten up the garden during some of the darkest days of the year. It is surprising that South African heathers are looking so well here at present for they are reputed to dislike damp conditions and we have just had one of the wettest autumns and early winters on record. Erica versicolor is not as frost hardy here as many other Cape Heaths such as E. canaliculata and E. pageana, but so far this winter the temperature has not fallen below - 3 ° C and a number of young plants are looking very much at home.